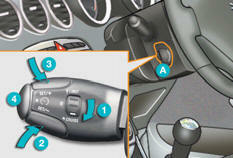 - position A on the electronic gear control gearbox or D on the automatic gearbox. To return to the programmed speed, simply release the accelerator pedal. Switching off the ignition cancels any programmed speed value. The controls of this system are grouped together on stalk A . The cruise control cannot, in any circumstances, replace the need to observe speed limits, nor can it replace the need for vigilance and responsibility on the part of the driver. the cruise control mode is selected but is not switched on (OFF). Set the programmed speed by accelerating to the required speed, then press button 2 or 3 (e.g. : 70 mph (110 km/h)). - in steps of + or - 5 mph (km/h) = maintained press. 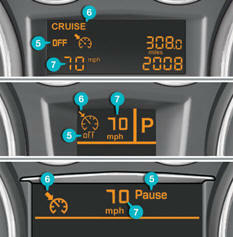 Switch off the cruise control by pressing button 4 : the display confirms that it has been switched off (OFF). Switch the cruise control back on by pressing button 4 again. Intentional or unintentional exceeding of the programmed speed results in flashing of this speed in the screen. Return to the programmed speed, by means of intentional or unintentional deceleration of the vehicle, automatically cancels the flashing of the speed. Turn dial 1 to the "0" position: the cruise control mode is deselected. The display returns to the distance recorder. In the event of a cruise control malfunction, the speed is cleared resulting in flashing of the dashes. Do not use the cruise control on slippery roads or in heavy traffic. On a steep descent, the cruise control will not be able to prevent the vehicle from exceeding the programmed speed. - never V one mat on top of another.